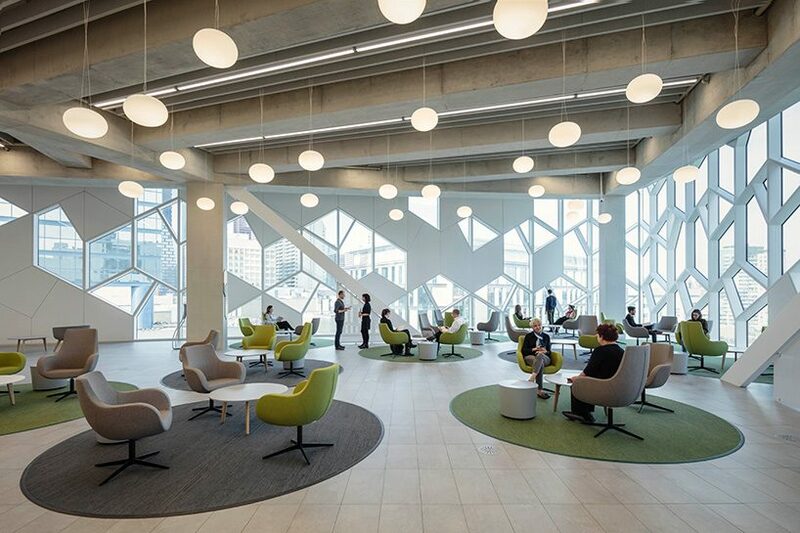 calgary‘s new central library by snøhetta and canada-based dialog aims to welcome over twice as many annual visitors in what counts as one of the largest library systems in north america, where more than half of the city’s residents are active cardholders. 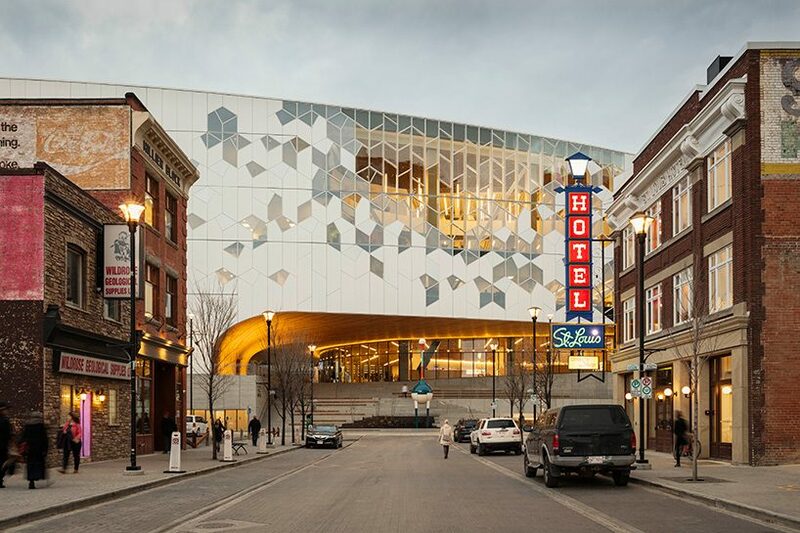 an expansion of the original structure built in 1988, the 22,297 sqm (240,000 sf ) building is now 2/3 larger than the original, and encloses a fully operational, half-moon shaped light rail line that was already part of the given site. 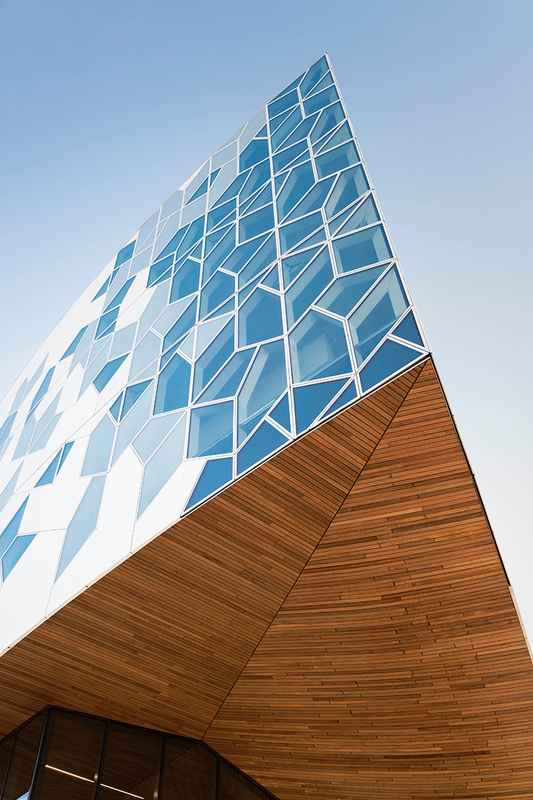 situated between downtown and the east village, snøhetta and dialog‘s new building, together with its surrounding plaza, re-establish visual and pedestrian connections between the previously split neighborhoods. 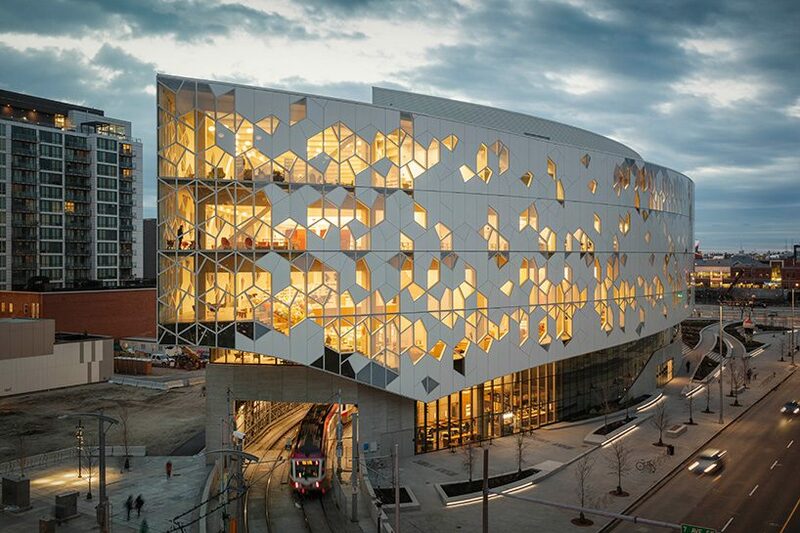 the library’s main entrance has been lifted to accommodate the rail line, while gently terraced slopes rise up in front and into the heart of the structure, with various amphitheaters nestled into them that provide places for people to sit and for library programs to spill outside. 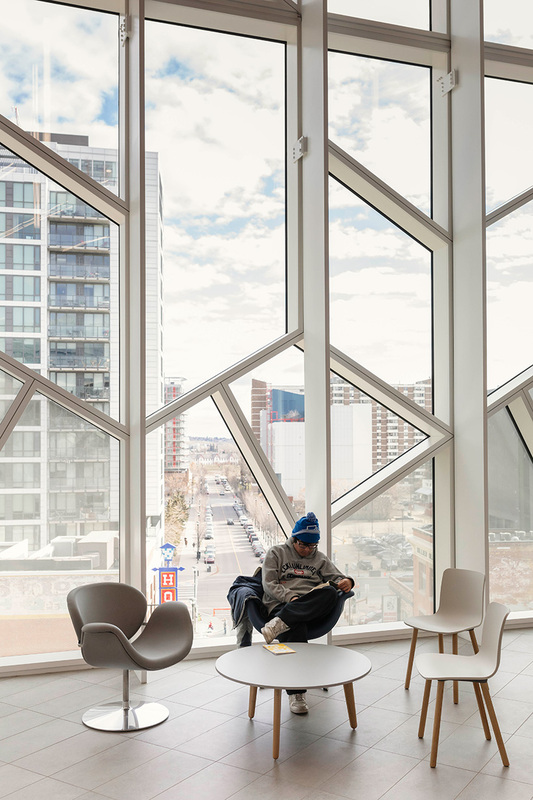 elms and aspen trees have been used to line the plaza’s surrounding tees, that together with several plantings draw calgary’s mountains and prairies into the cityscape. 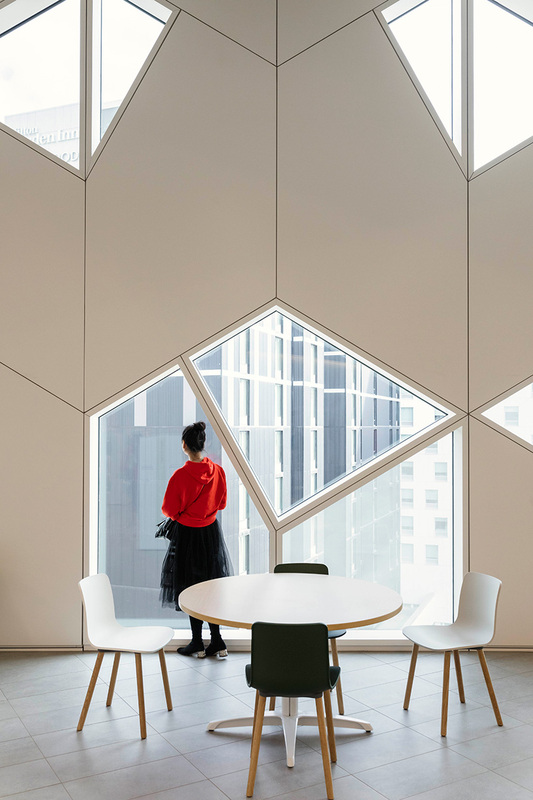 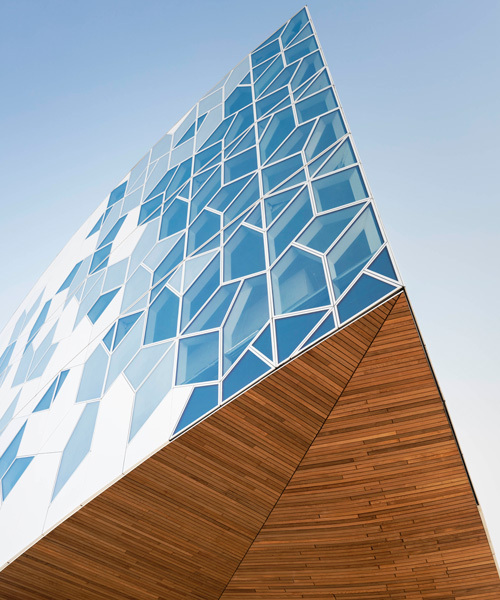 the entire building is wrapped in a dynamic, triple glazed façade composed of a modular, hexagonal pattern whose panel materiality varies to include fritted glass and the occasional iridescent aluminum. 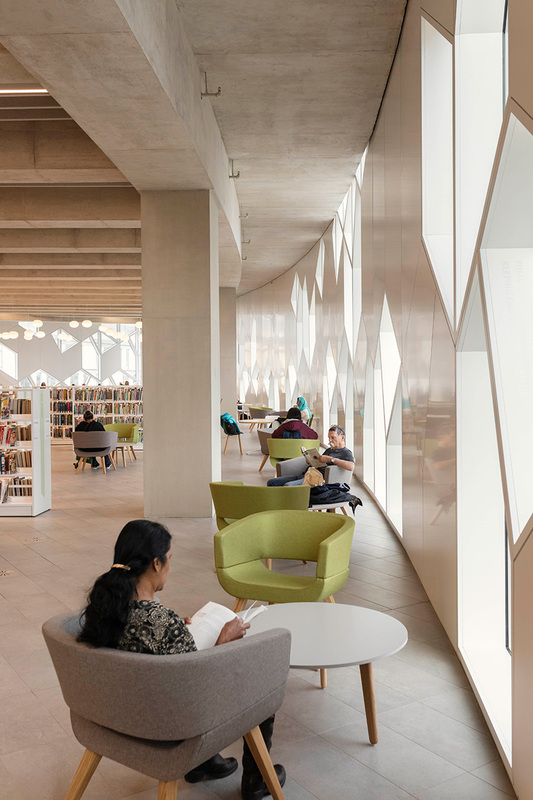 this vocabulary continues inside, expressed in the design of the library’s new visual identity and wayfinding signage in the building, unifying the design’s goals of inclusivity. 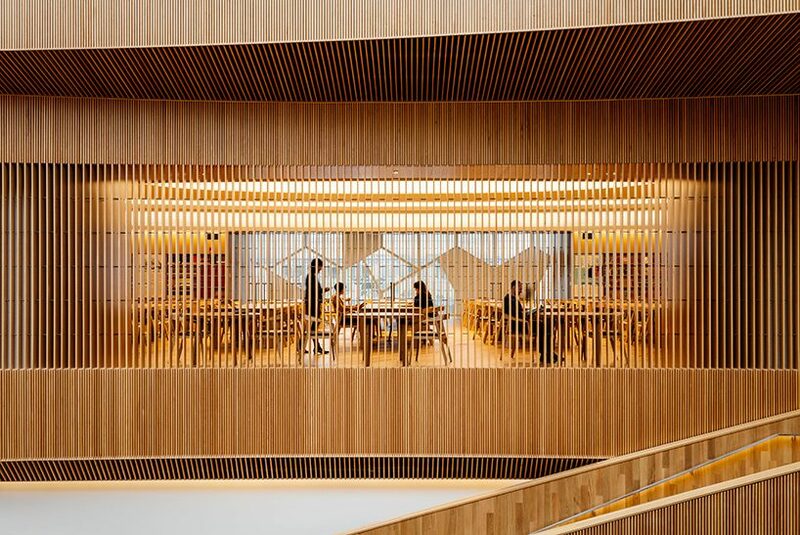 an expansive wood underbelly frames the main entrance and embraces visitors as they approach with a form that references the chinook cloud arches common to the region. 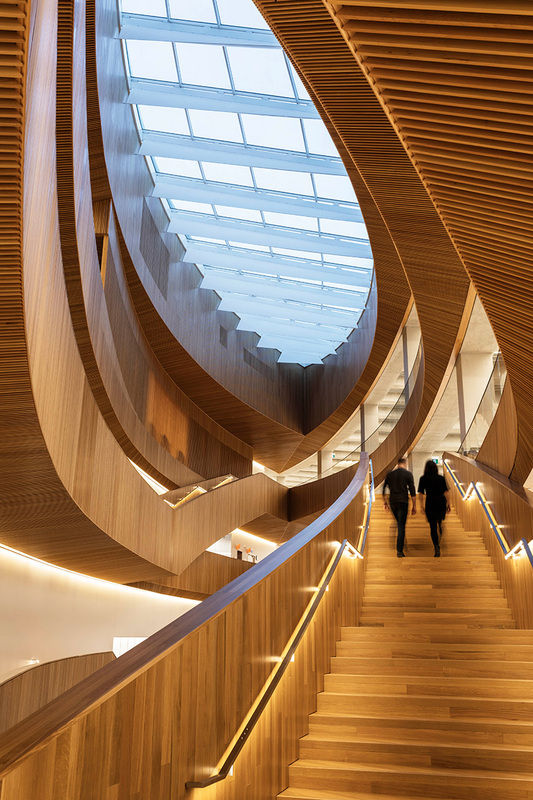 the double-curved shell is created entirely using planks of western red cedar from nearby british columbia, and now counts among one of the largest freeform timber soffit structures in the world. 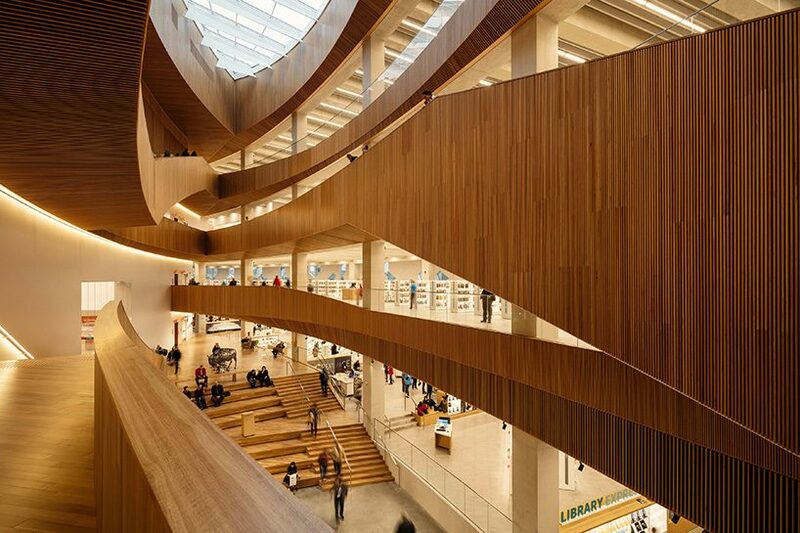 the main atrium, visible from the outside of the building, welcomes people into an over 25-meter-high space that draws the eye upwards to a view of the sky through the oculus. 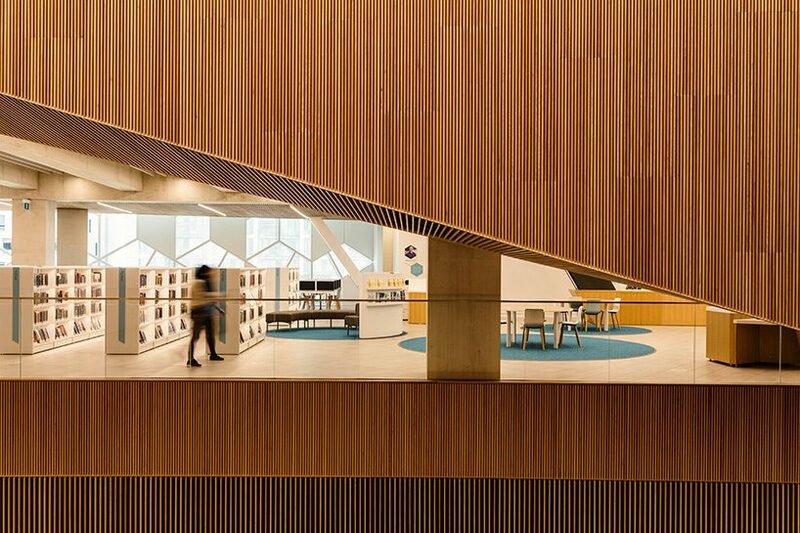 shaped in plan like a pointed ellipse, several wood slats line the perimeter of the open lobby and serve as an orientation device for visitors to easier understand the circulation and organizational logic of the library. 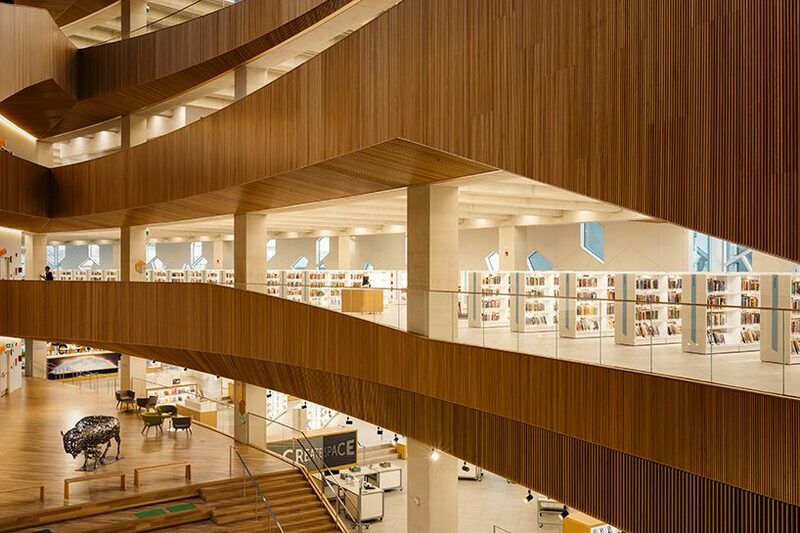 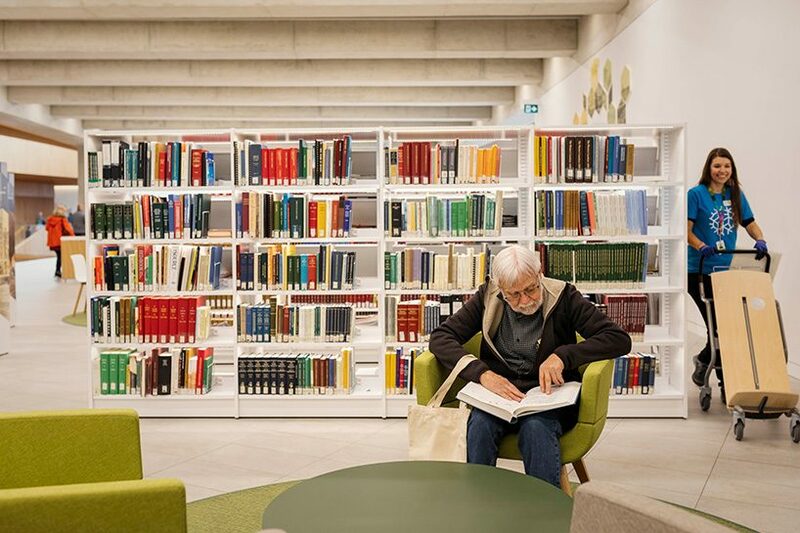 snøhetta and dialog have combined the wood with raw, unfinished concrete, intended to give people the sense that the library can be engaged with as they desire, rather than as a sacrosanct repository for books. 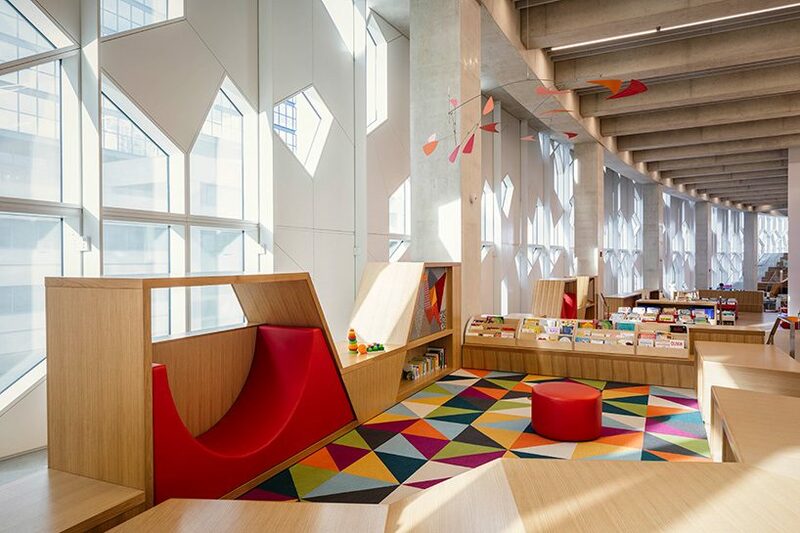 at the street level, a series of multi-purpose rooms line the perimeter of the building, while livelier public activities are located on the lower floors, gradually transitioning to quieter study areas on the upper levels before ending up in ‘the great reading room’, conceived as a jewel box tucked within the library. 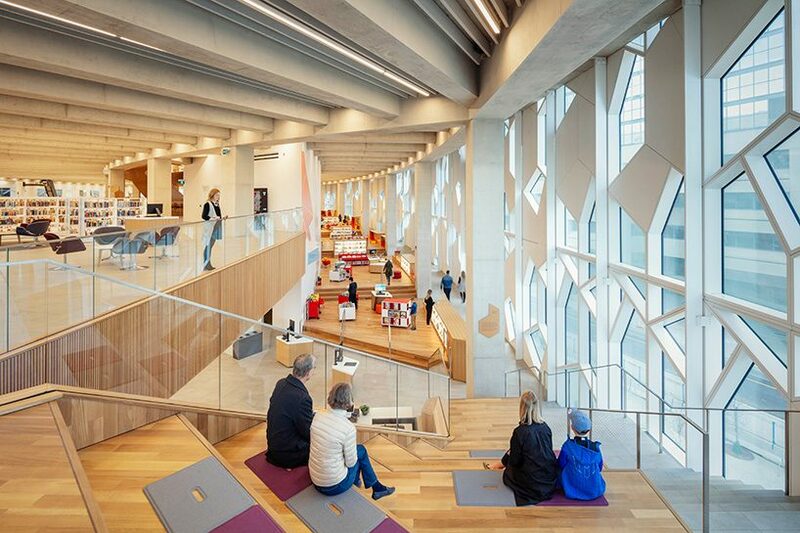 the northernmost point of the library marks another special space, ‘the living room’, which overlooks the train line and the meeting point of the two neighborhoods.